Best known for their large, blocky green peppers diced or sliced as seasoning for Italian or Mexican cuisine, bell peppers also grace the table in green garden salads or grilled up with savory sausage for a delicious treat. 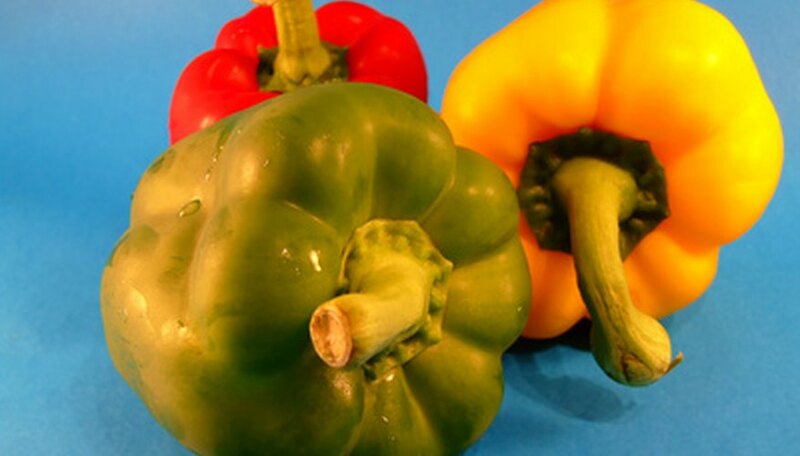 This versatile vegetable matures to bright red, orange or yellow with many hybrids available to add color and variety to any meal. Grown in the home garden, peppers require relatively little care other than watering, fertilizing and occasional pruning. Prune or pinch back pepper plants when seedlings reach 4 inches in height. Squeeze the center leaves between your thumb and forefinger to remove them from the stem. This encourages the plant to send out side shoots and develop dense, compact growth. Remove the first flush of blooms by pinching or pruning them from the stem. Under optimal growing conditions, this is not required. Plants that grow in less than optimal conditions (such as poor or dry soil) often benefit from the removal of blooms or buds, as this forces the pepper plant to produce a new flush of blooms and increases overall fruit yield. Prune back pepper plants by several inches after fruiting ceases to encourage the plant to re-bloom and set additional fruit. Although Northern climates do not have a long enough growing season to produce two crops of peppers, tropical or warm climates in Southern areas often benefit from a midsummer pruning and enjoy a second crop.